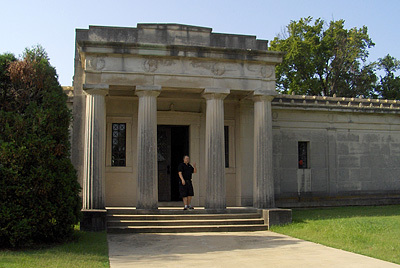 The crypt is located inside this mausoleum. Elvis Presley’s crypt has left the auction block. Celebrity auctioneer Darren Julien said Friday that his company has agreed not to sell the crypt after fans worldwide demanded that it be kept as a shrine to his memory. (= the petition) Julien’s Auctions announced in May that it would sell the empty tomb at the Forest Hill Cemetery in Memphis, Tenn., at its “Music Icons” auction Sunday. Julien said the company won’t sell the crypt “until Forest Hills finds a plan that best suits the interests of the fans while respecting and preserving the memory of Elvis Presley.” Presley was interred there alongside his mother, Gladys, after he died Aug. 16, 1977. Two months later, they were reburied at his Graceland home. The original crypt has remained empty ever since. I remember visiting the Forest Hill Cemetery together with fellow fans during Elvis Week in 2005. It feels good that the crypt that I saw then will remain empty, and that I played a small part in making that happen. So, thank you, fellow Elvis fans, and a big thank you to ElvisMatters member and Navy Officer Rev. Fred Omvlee who personally delivered a Letter of Protest from the fan club. I salute you!